Some of Namibia’s most promising athletes have left for the Commonwealth Youth Games in Samoa on Tuesday after a courtesy call at the Deputy Minister of Sport, Youth and National Service, Agnes Tjongarero, the day before. The global showpiece will see around 1000 Commonwealth athletes aged 14-18 from all around the world go head-to-head form 5-11 September. The action takes place in the nation’s capital, Apia, across two sporting complexes that will play host to Aquatics (Swimming), Archery, Athletics, Boxing, Lawn Bowls, Rugby Sevens, Squash, Tennis and Weightlifting. The biggest part of the Namibian team is comprised of the Rugby Sevens squad headed by Coach Patrick Ludick. He choose Hans Niehaus, Christiaan Ras, Riaan de Klerk, Armando van Wyk, Rudi Pretorius, Tristan Mouton, Romanzo Lento, Arnando Dentlinger, Popyeni Shikongo, Jan-Harm Cronje, PW Steenkamp and Allistar Miller to represent their country and fight for a medal. The athletics team will see Visamuje Ujaha, Siranda Horn (both high jump) and Nico Horn (javelin) participating. They are coached by Leoni Jansen van Rensburg. In the swimming disciplines, Zanre Oberholzer, Sonja Adelaar and Lushano Lamprecht hope to make an impact. Ryan Skinner is the coach. 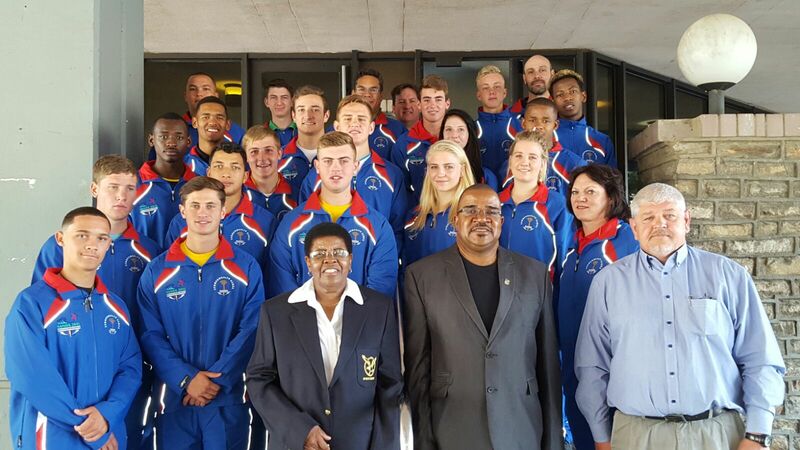 Meanwhile Xander Reddig (Archery/Recurve), Lesedi Jacobs (Tennis) and Carel Olivier (Bowls) are entered individually. Like the Commonwealth Games, all athletes stay in athletes’ village-style accommodation and events comply with the relevant IF’s technical rules and regulations, giving many competitors their first taste of an international multi-sport Games. World anti-doping standards also apply. Off the field of play, the Youth Games nurtures new sporting global citizens by focusing on friendship, integrity and cross-Commonwealth inter-cultural exchange – learning and living the Commonwealth Games Federation’s values of Humanity, Equality, Destiny. The host nation, Samoa, which means Sacred (Sa’) Centre (Moa) of the Universe, is a small, tropical island nation in the Central Pacific with a young population of 187,000, over half of whom are 25 and under. Launched in 2000 and now in its 5th edition, the Youth Games are a sustainable opportunity for smaller cities and nations to benefit from hosting a major sporting event, using predominantly pre-existing venues (in Samoa’s case constructed for the 2007 Pacific Games) whilst also promoting an inclusive and positive youth agenda.